When you want to dress with gorgeous style inspired by the Hellenistic period, make sure to come check out the fantastic Greek and Roman Earrings that we carry. Whether you are dressing as a decadent Roman citizen, Grecian goddess, or other Greco-Roman figure, these Roman and Greek earrings make a great finishing touch. Many of these earrings feature Greek and Roman motifs and symbols from their respective mythologies and cultures, such as owls, coins, dolphins, and more. These Roman and Grecian hook earrings are crafted from fine metals with many of them plated in gold for a bright gleam. Match these excellent Greek and Roman earrings with our other historical jewelry for a complete look! The Aureus of Domitian was an ancient Roman coin bearing the image of the Roman emperor Flavius Domitianus, more commonly known as Domitian. 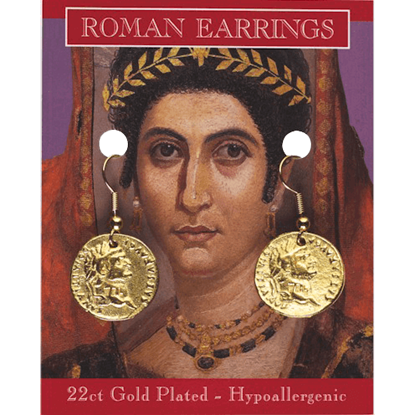 Show off your knowledge of Roman history with these Roman Coin Earrings. In Roman mythology, dolphins carried the souls of the dead to the Isles of the Blessed and ensured their passage to the afterlife. 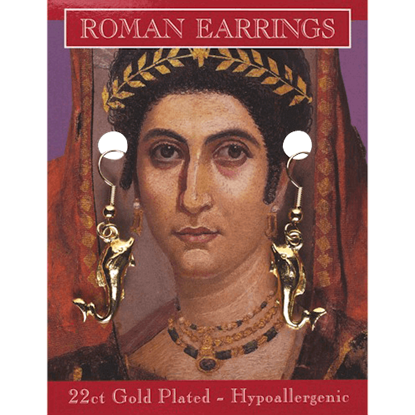 Show off your knowledge of Roman literature and art with these Roman Dolphin earrings. In Roman mythology, Minerva adopted the owl as a favorite, making it a symbol of protection and victory during times of war. 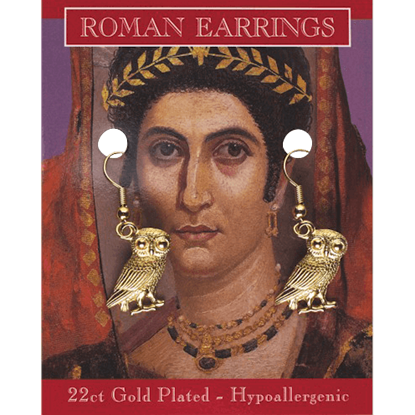 Show off your knowledge of Roman literature and art with these Roman Owl earrings. Finery worthy of a Roman empress, these pearl drop earrings provide an elegant look drawn from historical styles. 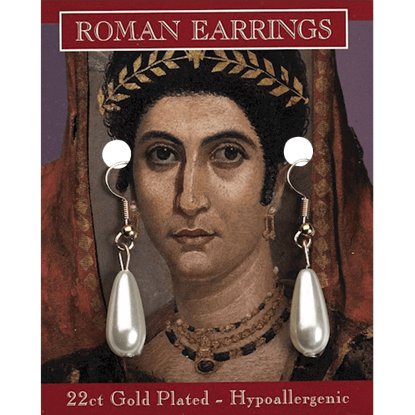 The Roman Pearl Earrings dangle from hypoallergenic ear wires that have been plated with 22 karat gold.